After a long cold winter, those itching for ‘A Taste of Spain’ should head to Regent Street on Sunday 6 June 2010 when central London will host this year’s Spanish festival. Graced with giant paellas, flamenco dancers, medieval food markets and a range of interactive sports challenges and events to demonstrate Spain’s vast sports offering, it’s a great mini holiday for all. With music, sports, dance and delicious ‘comida Española’, visitors will be whisked away for a day to Spain’s sunny shores. 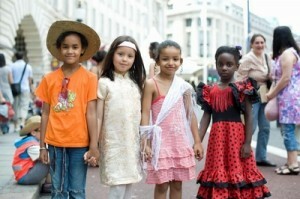 Spain is the UK’s favourite holiday destination welcoming over 13 million British visitors in 2009. For 2010 sports is the name of the game and for the first time a sports dedicated ‘Hall of Spain’ will be a key feature of the event where visitors will be able to wander through 80 years of Spanish sporting history and experience the diversity of sporting activities that are now available in Spain. In the interactive area, a pit-stop challenge awaits F1 enthusiasts who will have the chance to carry out an F1 tyre change against the clock. A unique F1 simulator will feature the Montmeló FI track in Barcelona and state-of-the-art MotoGP simulators will transport guests to southern Spain to the popular ‘Circuito de Jerez’. As well as motor sports, footballers can test their aim in the kick point challenge, tennis stars can compete for the fastest serve, basketball talent can try their luck in ‘shoot the hoop’ and golfing gurus can impress the crowds in the ‘nearest to the pin’ contest. But if that’s not enough, guests can unleash their inner child with a golf simulator in Madrid and a Scalextric track in Valencia. For those who prefer a more ‘relaxing’ Sunday afternoon, people can make use of a traffic-free Regent Street and stroll through the regions of Aragón, Andalucía and Navarra before taking a virtual tour through the medieval City of Segovia. In Aragón visitors can enjoy folk music by the Orquestina del Fabirol whilst Andalucía offers flamenco from the highly acclaimed Serva la Bari. From there, visitors can sample paella in the popular coastal region of Valencia or head to the capital city of Madrid where impressive golf installations demonstrate Madrid’s current bid for the Ryder Cup. After exploring the delights of mainland Spain, guests can pop over to Gran Canaria to have their picture taken on the island or across to the Balearics for face painting, virtual horse riding and some well deserved island sunshine. Gastro fans can sample some of the tasty delicacies that Spain has to offer such as suckling pig in Segovia, refreshing gazpacho in Andalucía, cheese and typical foods from Navarra, and the iconic jamón in Aragón. In addition Regent Street’s famous retail outlets will also be joining in the fun and to celebrate “A Taste of Spain” will be offering merchandise, competitions and one-off tasting sessions. On the main stage the highly acclaimed Spanish guitarist Paco Fernández and La Gente del Sol plus Foc i Fum from Ibiza will woo the crowds with hair raising riffs and surprising dance scenes. In addition, Spanish indie artist Annie B Sweet from Málaga will perform a unique set and brass band Charanga La Chicuelina from Segovia will certainly fuel the fiesta. 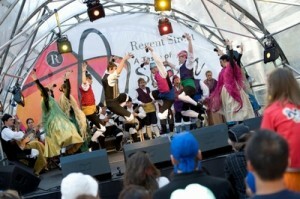 Throughout the afternoon traditional flamenco dancers from Andalucía will demonstrate their gypsy flair and guests will even get the chance to participate in a traditional Spanish dance lesson. 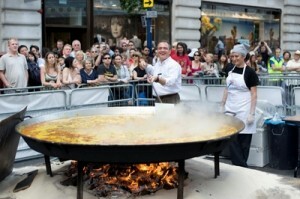 “A Taste of Spain” will take place on Regent Street, London W1 from 12 noon – 7pm on Sunday 6 June 2010. Can’t wait for this! was amazing last year! !